That's the fitting title of the current exhibit at the Dorval Museum. It's fitting because Dorval is home to Montreal's Trudeau international airport, so named for our former famous Prime Minister. I had occasion to meeet him briefly in his retirement back in 1997. It's weird to think that I personally met someone with an aiport named after them. Dorval is also host to a stop on the trans-continental railway, and it's the automobile that made Dorval one of the metropolis' early bedroom communities. 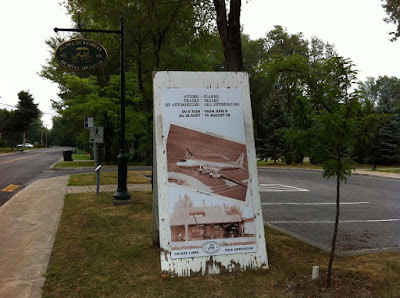 I've been living on the West Island for more than twenty years and only recently became aware that Dorval had a museum. It's on Lakeshore Blvd. which is my usual commuting route. The pace is a little more leisurely. You are connected to the path you follow because the sounds, sights and smells are experienced more intimately than in a car. It's somehow easier to stop and check things out because the scooter is small and so manoeuvrable. You tend to take more quiet routes where there are more interesting things to see. 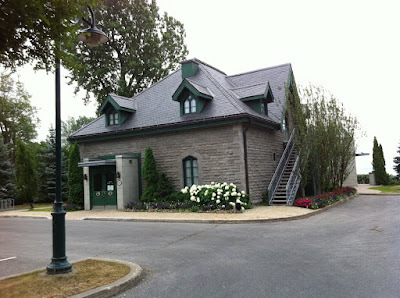 The Dorval Museum is a case in point. 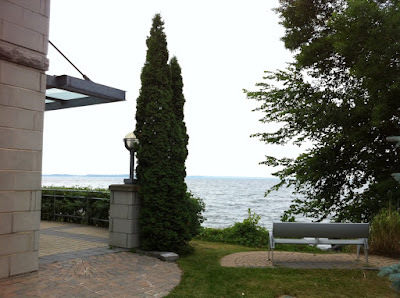 I had noticed it during my commutes, tucked away along the lake, a stone's throw from the Forest & Stream Club. I have a previous post on the club that you can get to by clicking here. Thursday morning I took a few minutes out to explore. 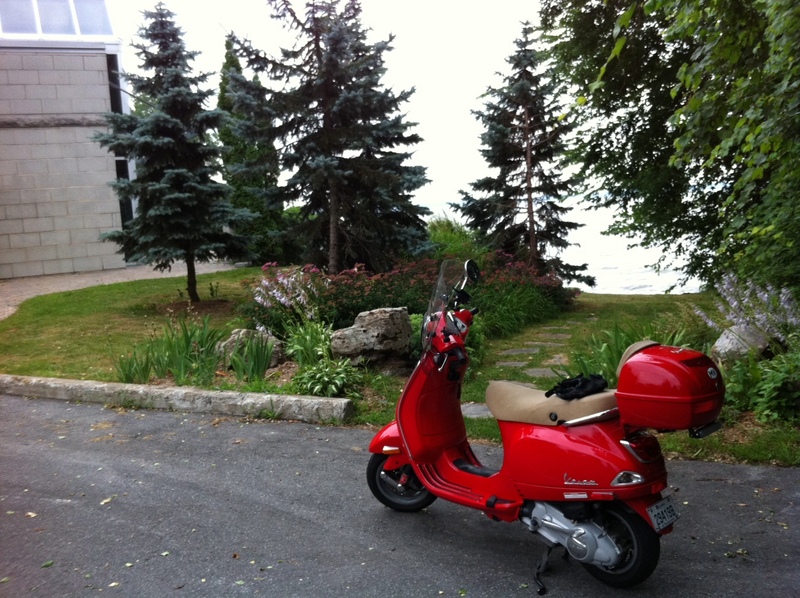 I parked my Vespa at the back of the empty parking lot where there's flagstone path leading to the water's edge. The museum is only open in the afternoon so I peered through the window for a glimpse of what this tiny museum might have to offer. 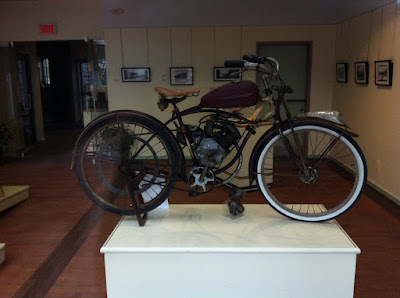 I was a little surprised to find a moped in the museum, although finding a lifesize plane, train or even automobile would have been shocking. That serendipitous find dovetails nicely with the two-wheeled theme here. I made a mental note to pop in sometime this summer to see what else this little gem has to offer and find out the story of that moped. I love little museums, they are so interesting and truly give a perspective of what life was and is in an area. I agree with your concept of scooter digressions. I tend to seek out quiet routes and conversely I go places which are usually too crowded to take the car, as there are no parking issues when I am on the scoot. I look forward to seeing pictures of the little museum's conents. I love scooter ramblings and the places it takes me. I, too, have found that there's something about small cc's scooter/bike commuting that opens me to the areas I travel through in a way I was never open to them in a car. I think your bullet points are right on. I especially agreed with the one that mentions " . . . sounds, sights and smells are experienced more intimately than in a car." True. True. Very true. Dar: if I find the time to visit that museum I'll update the post with more details and photos. Circle Blue: checked out your blog and added it to my list of blogs. Glad to hear you're OK. I'll be reading more. Take good care.